Cuisine et Château Inc. started in 2010 out of a desire to share an infectious passion and knowledge of great food. Originally a company that provided all-inclusive, luxury culinary tours to southwestern France, in 2011 we expanded to offer specialized catering, private cooking classes and custom corporate events. As the interest of our local gourmands continued to rise, we decided to establish a permanent location to accommodate the demands of the ever-curious food enthusiast — from amateur to professional. In 2012, Cuisine et Château acquired a space in the Kensington area of Calgary, and built their Interactive Culinary Centre, providing a state-of-the-art facility to host an incredible variety of cooking classes, educational events, tastings, and private functions. All of our chef instructors are professionally trained, with experience working in the challenging, yet rewarding, kitchens of France. Whether making a Cambodian fish amok curry, or a classic Italian risotto, the fundamentals of French cooking techniques can be applied. Understanding ingredients and how to use them together, no matter what your level of expertise, can add a special appreciation and enjoyment to the simplest of meals. Let us forever change the way you think and feel about food. After nearly 30 years working as a professional chef, it is Thierry’s passion for combining food and gastronomy with history and culture that makes him such an outstanding chef, teacher, and guide. His understanding of simple seasonal ingredients and classic French culinary techniques has earned him international recognition. For 10 years, in his own restaurant, he delighted clients by twisting local ingredients and French classics. Reservations for a Friday night at his “La P’tite Table” were made over a month in advance, and anxious patrons were never disappointed. Thierry is thrilled to be sharing his love of food and ingredients, and the rediscovery of his French heritage with small groups of clients in a week-long culinary journey through the heart of France’s unspoiled region of Périgord. Born in Orléans, in the Loire Valley of France, Thierry attended cooking school in Paris, where he stayed for several years to hone his skills in Michelin-starred restaurants. The Hilton Group allowed him to start his international career, first at their prestigious Kensington location in London, England, and then Toronto to head up their fine-dining restaurants. He eventually settled in Calgary as the executive Chef of La Chaumière. After winning the Châine de Rôtisseurs 1996 Dinner of Honourable Distinction award, he opened La P’tite Table, a unique destination restaurant in the Alberta Foothills where he was both chef and owner. Before the establishment of Cuisine et Château Interactive Culinary Centre, Thierry spent five years sharing his passion with students as a culinary instructor in the Professional Cooking Programme at SAIT, a Calgary-based polytechnic, where he inspired budding new talent. After 18 years in the food business, Marnie sees her position at Cuisine et Château as the perfect blending of all of her experiences, both as a pastry chef and seasoned business manager. In 1995, Marnie started a unique whole fresh produce business that serviced restaurants and hotels in Calgary and Banff. The Basil Ranch was one of the first companies of its kind in the region, designing its product list based on its relationship with clients and their individual needs. In 2002 she started Palette Fine Foods, a gourmet food manufacturer that created unique retail culinary products, all inspired by the ingredients she had sourced for so many years for her chefs/clients of The Basil Ranch. These products won numerous awards and filled store shelves in every US state, as well as several large chains both in the UK and Canada. In 2006, Palette was sold to a US corporation, and Marnie stayed on as Creative Director for the merger for 18months. It was during this time that she found that her fundamental knowledge of food chemistry and baking science for product development could be enhanced, and she enrolled in the Baking and Pastry Arts programme at Calgary’s Southern Alberta Institute of Technology. Since completing the program, Marnie has worked in Paris at the famous Hôtel Lutetia, done a stage at a French boulangerie, and developed her skills as a pastry chef at some of Calgary’s best restaurants and hotels. 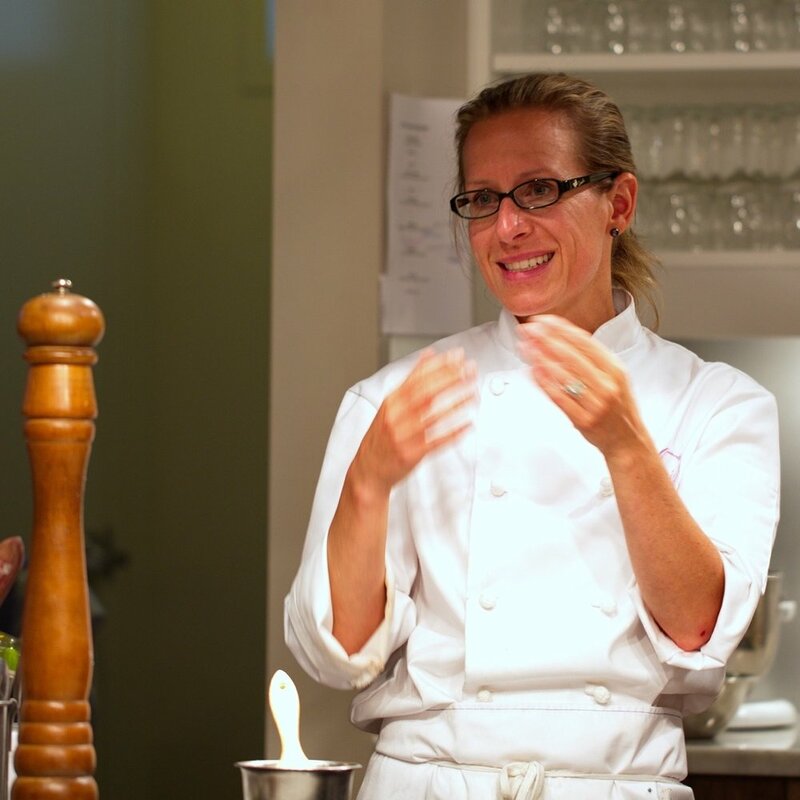 Prior to launching Cuisine et Château, she instructed evening classes on artisan breads and desserts to enthusiastic adults through continuing education programs at a Calgary-based polytechnic. Marnie shares her most precious gift, her understanding and love of classic desserts and bread baking, by instructing classes and customized corporate events for Cuisine et Château Inc.
Rafael’s passion for cooking was ignited early by his own curiosity and encouraged by his Abuelita (his dear Grandma). From her he learned cooking secrets from his family’s German, British, French and Mexican heritages. After having achieved a business degree in his native Mexico, he felt that something was missing, so he continued his search. Rafael began a new journey starting at the cooking Institute in Buenos Aires (Argentina). The city and the Institute warmly welcomed him and trained him as a Chef while cooking at its fine dining restaurant. His next step in the adventure took him to San Sebastian (Spain), where he trained and cooked under several Michelin-starred Chefs, learning more than he can say. Rafael is now delighted to find himself in this beautiful city of Calgary. In Canada he rapidly climbed the ranks of several fine dining restaurants, ran a couple of kitchens, and has now rekindled another part of his passion: teaching. That’s where Cuisine et Chateau enters this story and opens its doors to Rafael. He receives much enjoyment from sharing his deep culinary knowledge to eager and adventurous students, hoping to help them forever change the way they think about food. Rafael brings to Cuisine et Chateau over 20 years of experience in culinary experience from four different cultures with passion, creativity and resourcefulness. Mikaela has been in the hospitality industry for 8 years. She gained her passion for the industry while working as a Banquet Captain at the Calgary Stampede Catering Department. Mikaela graduated the top of her class from SAIT’s Hospitality Management program in 2015 with many accolades. She joined the team on the Royal Canadian Pacific Railroad where she honed her skills by learning high end service techniques and culinary styles. Mikaela is active in the community as a weekly volunteer with Canadian Blood Services for the past 8 years. Mikaela also follows her passion for music by volunteering and enjoying the music of Sled Island. Mikaela loves customer service and truly enjoys been part of the class ambience of the instruction and the clientele. Her devotion to exceptional customer service makes every day she spends at Cuisine et Chateau a fulfilling experience. Jeff spent his early years training right here in Calgary. After graduating from SAIT Jeff took up a position at the famous La Chaumière Restaurant in 1977. He then worked at the Four Seasons Calgary before going the new Delta Bow Valley Hotel. Always on the lookout to leave Canada and per sure his career internationally Jeff was awarded a position on the six man team for His Majesty King Hussein of Jordon in the Amman Royal Palace. After a brief stint back in Canada at the renowned Queen Elizabeth Hotel in Montreal Jeff, his wife Joan, 18 month old Michelle and 5 month old Joel left Canada again, for the shores of Australia. After several years in Australia with Hilton Hotels Jeff was offered a position with Hilton Hotels in Jakarta Indonesia and then to Bali Indonesia to open the flag ship Hilton Resort. That is where things changed and Jeff as spent the last 30 years in Asia working in Indonesia, Malaysia, Hong Kong, Thailand and Singapore. After planning to semi retire and “give back”, Jeff volunteers with the Canadian Cancer Society and teaches basic cooking for one of the many Mustard Seed programs. Being eager get back to Canada and his roots, he brings a wealth of knowledge in not only Asian cuisine but a knowledge on how to marry together flavors from both the East and the West and create flavors with a European twist. There isn’t much that Chef Xavier Lacaze hasn’t done in his past 7 years in Calgary. After jetting in from France in 2008, Lacaze has run a couple reputable restaurant kitchens, earned a respectable Top 5 finish on Season Two of Top Chef Canada was a part owner of Briggs Kitchen and Bar, as well as an incredibly talented professional chef, passionate for flavor and simplicity. What does simplicity means to Chef Lacaze? As a young child, Mathieu Paré landed in Calgary, Alberta from the wilds of northern Quebec and immediately set off exploring. From the eastern slopes to the Cypress Hills, the boreal forest to the U.S. border, he foraged the landscape for edible plants and animals, eventually crossing the Rockies and the Strait of Georgia in pursuit of wild foods. Now a Governor General Award winner and professional chef, Mathieu brings a passion for all things wild and an expertise in fine dining to the table. Trained in Western Canada’s most demanding kitchens (La Chaumiere, Rouge, Quail’s Gate Estate Winery, CP Rail’s The Royal Canadian Pacific), Mathieu’s focus is on classic technique and execution while maintaining some freedom for surprise, fusion and one-of-a-kind creativity. As a young chef, Mathieu travelled extensively to develop his palate and diversify his repertoire. Sharing his food knowledge and travel experiences from across Canada, in Asia, Latin America and the Caribbean, Mathieu builds on a platform for exploration of indigenous and exotic ingredients. Now working at Charbar, in Calgary’s redeveloped East Village, Mathieu specializes in whole animal butchery and charcuterie, dry aged Alberta beef and Argentine style wood fire cookery. Chef Mathieu brings his passion and years of culinary adventures to each class and event at Cuisine et Chateau.